A new report by researchers at University of Wisconsin and University of California, Berkeley, aims to overturn the long-held belief that girls aren't as good at math as boys. According to new data, the researchers say, that gender gap has become a myth  a finding they hope will help shift the very real gender gap in math, science and technology professions, which are currently dominated by men. Janet Hyde, a psychologist at University of Wisconsin, and her (all-female) collaborators culled data from federally mandated annual math tests administered to 7.2 million second- through 11th-grade students in 10 states. 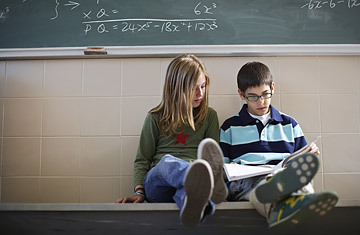 They found little difference between boys' and girs' average math scores. Hyde also searched for a gender difference in the outlying scores  that is, whether more boys were among the top math scorers than girls  but again found negligible difference, although boys did still slightly outnumber girls in the 99th percentile. The equalizing of math scores may reflect the simple fact that more female students are now taking math courses, says Hyde, whose study, funded by the National Science Foundation, appears in the current issue of Science. In Hyde's earlier research in the 1990s, she found that girls and boys scored similarly on math tests in elementary school, but that by high school the boys were overtaking the girls. Why? Because somewhere along the way, girls stopped taking math and never learned the skills required to do well on standardized tests. Today, girls are increasingly sticking with math classes through school  according to the paper, girls and boys take advanced math in high school in equal numbers, and women receive nearly half of all bachelor degrees given in math in the U.S.  and their scores are closing the gap. But "the stereotype that boys are better at math is alive and strong," Hyde says. "Parents still believe it, and teachers still believe it." That skewed view  and not some lack of aptitude  may be what keeps girls from pursuing math and science as a career. But Hyde notes that more and more girls are continuing to study math through high school and college, which points to the fact that female students are increasingly aware of the careers that are open to them. These students are making forward-looking decisions about what courses to take in high school, Hyde says, based in part on what they want to do next. The next step, she says, is attracting more women to the graduate and career levels in math. "Mathematics and science departments need to work on making graduate departments more women-friendly for not just the students but for the faculty as well," says Hyde, by encouraging more women into their ranks where they can serve as role models for future generations of female students. "What I am hoping is that as this cohort of girls, who are taking calculus in school, pass through the system, they will get more gender equity in the highest level research jobs in science and math," she says.